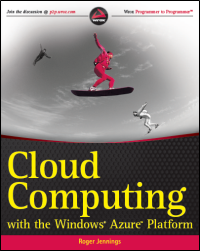 This post describes how to configure and deploy two 8-core HPC clusters hosted in Windows Azure and submit the LSICloudApplication to the Windows Azure HPC Scheduler for processing. Configuring, deploying and submitting the other two examples differs only slightly. Update 1/30/2012: Added review and link to a PDF copy of David Skillcorn’s Understanding Complex Data Sets: Data Mining with Matrix Decomposition (Chapman & Hall/CRC, 2007) in the “Learning about the Latent Semantic Indexing Example” section below. Update 1/28/2012: Added step 2 to the “Extracting and Running the Latent Semantic Indexing Example” section to change build configuration from the default Debug to Release. This change prevents failure of the job submitted to the Windows Azure HPC Scheduler in step 33. Note: See the Introducing Microsoft Codename “Cloud Numerics” from SQL Azure Labs post’s “‘Cloud Numerics’” Prerequisites section (updated 1/28/2012) if your Visual Studio 2010 installation doesn’t have the Visual C++ features installed. This tutorial assumes that you have a pay-as-you-go subscription. If you don’t, go to the Account page, click Add Subscription and sign up with your credit card. A deployed Codename “Cloud Numerics” application with the minimum number of head (1), compute (2) and Web FrontEnd (1) nodes will cost you $2.16/hour while it’s deployed. Compute nodes are Extra Large instances, which use 8 cores each, so 18 cores are deployed at US$0.12/core*hour. You also will be charged about US$0.33/day (US$9.99/month) for a 1-GB SQL Azure Web edition database. Note: You can run the LSICloudApplication project locally with a 3-Month Trial Subscription’s Windows Azure storage account. See the “Running the Latent Semantic Indexing Example Locally” section near the end of this post for details. 1. Select your pay-as-you-go subscription and click the Manage button to open the Windows Azure Management portal. Note: You will use your Subscription ID in the next section. The C# LSI example constructs and operates on a term-document matrix --an array where columns correspond to documents, rows correspond to individual terms, and the elements correspond to logarithmically scaled frequencies of terms in each document. Ronnie continues with details of the seven steps involved in performing the calculations and writing the result to a Windows Azure blob. David Skillcorn's book on matrix decomposition techniques is superb. I especially enjoyed his coverage on non-negative matrix factorization (NNMF) techniques and eigendecomposition (i.e. spectral techniques). I would recommend the book to those interested in data mining and knowledge extraction. The techniques cover a wide range of media and are not simply restricted to relational datasets and textual documents. The treatment of PageRank is concise and articulate: demonstrating the deep relationship between graph mining and learning techniques and matrix decomposition (SVD amongst others) techniques that make search engines such as Google and Bing possible. As a reviewer summarized, "The author explores the deep connections between matrix decompositions and structures within graphs, relating the PageRank algorithm of Google's search engine to singular value decomposition. He also covers dimensionality reduction, collaborative filtering, clustering, and spectral analysis. With numerous figures and examples, the book shows how matrix decompositions can be used to find documents on the Internet, look for deeply buried mineral deposits without drilling, explore the structure of proteins, detect suspicious emails or cell phone calls, and more." Extracting the files creates a \My Documents\Visual Studio 2010\Projects\LSICloudApplication subfolder. Note: For currently unknown reasons, submitting a job built in the debug configuration fails. This problem is under investigation. This step was added on 1/28/2012. 3. Press F5 to build and run the application for the first time. If you receive errors and warnings as partially shown here due to missing references in the DictionaryReader.cs component, you probably have installed the project to C:\Users\UserName\My Documents\Visual Studio 2010\Projects\LSICloudApplication\LSICloudApplication, instead of C:\Users\UserName\My Documents\Visual Studio 2010\Projects\LSICloudApplication. Copy the contents of the installation folder to the first LSICloudApplication folder, overwriting the contents of the subfolder. 5. Open the Windows Azure Management Portal, click the Hosted Services, Storage Accounts & CDN button and the Active button in the Deployment Health Status column to display your active Subscription(s). 6. Select the subscription to use for this and the following examples and copy the Subscription ID to the clipboard (see step 2 of the preceding section). 7. Paste the value into the Subscription ID text box. Note: You can have up to 10 Management Certificates for a hosted service. 12. Click OK to close the message box and return to the Deployment Utility. 15. Click OK to close the dialog and, after the certificate’s status is Created, return to the Deployment Utility dialog. wait a minute or two and try again. You will use the storage account Name and Primary Access Key values later in this section. Note: Cores used = 0 because the services haven’t been deployed yet. Running the LSICloudApplication locally created the lsiresult blob. You must run the application locally to create the *.exe and copy local the required libraries, as described in the “Running the Latent Semantic Indexing Example Locally” section near the end of the chapter. Return here after completing the operation. 29. When the Job Successfully Submitted message appears, close the dialog. 36. If you don’t want to be charged US$2.16 per hour for compute instances and US$0.33/day for the database, return to the Windows Azure Management Portal and delete the Deployment for Windows Azure and hosted service (oakleaf1lsi for this example), as well as the database created during the configuration process. The Introducing Microsoft Codename “Cloud Numerics” from SQL Azure Labs post’s MSCloudNumerics solution is self-contained and uses locally-generated matrices with random values as its input data. In local mode, the LSICloudApplication downloads text data from http://cloudnumericslab.blob.core.windows.net’s public financialdocs container, processes it with the local copy of the Microsoft HPC Pack 2008 R2 MS-MPI Redistributable Pack (Mpiexec.exe), and uploads the results to the Windows Azure storage account you created in the preceding section. The AzureSampleService project contains a Roles node with ComputeNode, FrontEnd and HeadNode subnodes, as well as ServiceConfiguration.Cloud.csfg and ServiceConfiguration.Local.csfg configuration files. The latter is used when running the LSICloudApplication locally. 1. Right click the LSICloudApplication node and choose Set As Startup Project. 2. Press F5 and wait for the console window to appear. 3a. Click OK to close the message box, right-click the LSI CloudApplication node and choose Properties to open its properties pages. 3c. Press Ctrl+Shift+B to build the solution with the new user name. 4. Open LSICloudApplication project’s Program.cs file, scroll to line 224, replace myAccountKey by pasting the storage account’s Primary Account Key value, which you can copy to the clipboard as shown in step 20 of the preceding section, and replace myAccountName with the name of your storage account, oakleaf1lsi for this example. When Mpiexec.exe completes execution a few minutes later and sends its data to a blob in Windows Azure storage, the Command Prompt window replaces Mpiexec.exe’s window. 8. Right-click the AppConfigure project and choose Set As Startup Project to re-enable deployment to Windows Azure. 9. If you were in the process of configuring and deploying LSICloudApplication to Windows Azure when you ran the program locally, press F5 to restart the program, click the Check Cluster Status button to enable the Submit Job button and continue at the “Configuring and Deploying the Windows Azure HPC Cluster” section’s step 28 to upload the application code and libraries to the Windows Azure HPC Scheduler.